Finishing in or around the NHL basement over the past nine seasons has been a tough pill to swallow for fans of the Carolina Hurricanes, but the rewards that come after failure are becoming apparent. 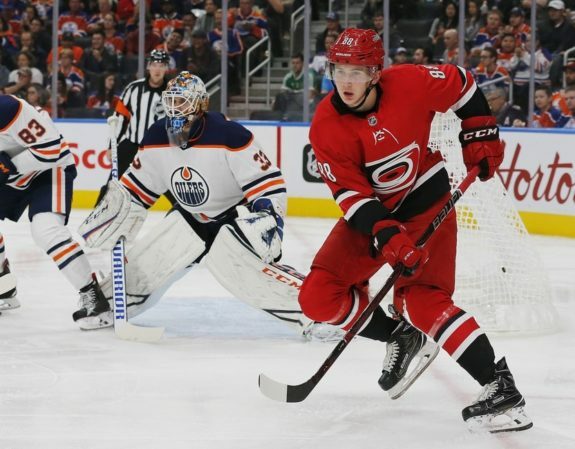 Prospects-turned-lineup-regulars like Jaccob Slavin, Brett Pesce, and Sebastian Aho have kept the ‘Canes competitive and given the team and fans hope for the future, and prospect Martin Necas is poised to become another example. Former GM Ron Francis drafted Necas 12th overall in June 2017, and he put on quite a show at the prospect development camp last week. Here’s a look at what Necas brings to the ice and his potential impact at the NHL level, including his timetable to make the team full time. The most exciting aspect of Necas’ playing style is that he is not one-dimensional. The Czech-native boasts the ability to capitalize on the smallest mistakes made by the opposition. While he is not big at 6-foot-1, 180 pounds, Necas can create space with power maneuvers and he has tremendous skating ability, agility and the stick and puck handling skills to keep the puck away from opposing defenders. He’s got a decent shot too. When he can marry his skills into a cohesive unit, he will be a real threat. While he was not a top-10 pick, Necas was drafted high at 12th in 2017. This was due, in large part, to his strong showing internationally at the World Juniors and at the Hlinka Gretzky Cup, where he showcased both his dynamic skillset and his ability to get on the scoresheet. At the draft, he was considered a project because of his small stature, but he has since filled out nicely in just over a year. Over the past year, Necas has “wowed” spectators with his performance in the Czech Extraliga. With HC Kometa Brno, he improved on his 0.37 points per game from the 2016-17 regular season to 0.71 points per game in 2017-18. He then scored four goals and nine points in 14 playoff games en route to Kometa Brno’s second consecutive Extraliga title. He impressed again at the World Juniors with three goals and 11 points in seven games, leading the Czech Republic to a fourth-place finish, their best since a 2005 bronze medal. Coming into the 2018-19 season, Necas is looking to move to North America and build on his success. How Do the Hurricanes Utilize Necas? Predicting the potential impact of teenagers is a fool’s errand but in many ways, Necas’s game has matured so much recently that we have a grasp on what he could accomplish at the NHL level. Some natural centers need time to grow into the role but it seems that Necas will begin his North American career down the middle, as he has a strong two-way game already. With that being said, the position he plays may influence what team he’s assigned to, either in Charlotte or Carolina. At the development camp, Necas dazzled. He was one of, if not the, best youngsters and he and Andrei Svechnikov showcased their skill and surprising chemistry. Watching the two play together was a treat, and while Svechnikov is a lock to make the Hurricanes’ opening night roster, Necas is almost guaranteed to make the big club at the start of this season. If Necas does make the ‘Canes roster, we can anticipate that he will initially play in a bottom-six role unless he earns his way into a higher position and deserves more ice time. Head coach Rod Brind’Amour won’t be giving handouts, but Necas has already proven that he can both drive a line and play well with other skilled players, so it is possible that he earns a top-six role at some point. The future is bright for the Hurricanes, and all signs point to Martin Necas being a part of the solution in Raleigh.